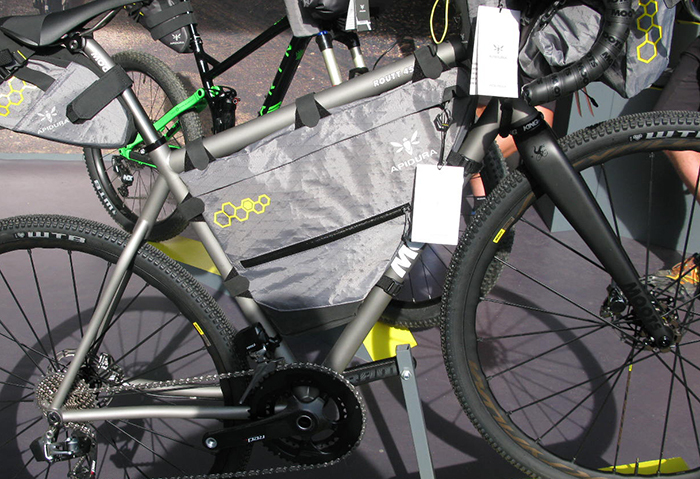 The Eurobike trade show is always a yardstick indicator of what to expect on the shelves and in the showrooms for 2018. Tim Maloney, Simpson's International Correspondent shares his show highlights. London based Apidura is in the forefront of the bike packing revolution that is totally changing the face of bicycle touring. Apidura’s mission statement says “We are driving the evolution in ultralight cycling and opening a new world of riding possibilities for passionate cyclists.” The Moots Rout RSL is decked out with the Full Frame pack, Top Tube pack, Handlebar Pack and Saddle Pack for a go-anywhere, anyway cycling experience. Endura Encapsulator speedsuit: Scots apparel outfit Endura Ltd took a prestigeous Eurobike Award for their Endura Encapsulator Speedsuit, developed with aero guru Simon Smart of Drag2Zero and tested in their facility at the Mercedes AMG Petronas F1 wind tunnel in Brackley, Northants. Part of Endura’s D2Z range, Encapsulator is the suit of choice for Movistar, Cervelo Bigla women's team and was ridden to successful World Hour Records by Alex Dowsett and Bridie O’Donnell. Endura Encapsulator speedsuit is maximized for speeds over 45km/hr. The detailing of Endura Encapsulator speedsuit, highlights the new textured upper arm and side flank fabric for reduced drag. “We adopted a fresh perspective and exploited a technology that none of our competitors was using,” explains Jim McFarlane, Founder and Managing Director of Endura. “The results have been phenomenal. Endura’s SST™ technology uses strategically-placed 3D chevrons to positively aﬀect airﬂow around the body, reducing drag at speeds relevant to the target rider. Pirelli P Zero Velo: Molto Noise about Pirelli P Zero Velo bicycle tyres this summer, using a similar rubber compound to the famous Pirelli P Zero automobile tires called Smarnet Silica. P Zero Velo is available in 23, 25 & 28mm widths, with an anti-puncture aramid fibre (kevlar type casing) bit disappointingly, the casing is only 127 tpi, which is not as supple as 320 tpi offerings from other brands in the same price range. Ridley Gorilla: Although Lotto-Soudal’s Andre Greipel’s 2017 season hasn’t been up to his usual level, the 35 year old German sprinter is still one of the most simpatico riders in the pro peloton. His nickname of “Gorilla”, thanks to his imposingly muscled physique, is well illustrated by the cool Gorilla icon that decorates his speedy white Ridley Noah. Storck Aernario2 Signature: German über bike maker released this Storck Aernario2 Signature model at Eurobike to much fanfare. Why? This Storck Aernario2 Signature Platinum 55cm bike weights only just 5.46 kg / 12.04 lb! Only 53 of the Signature models are available and are equipped with stellar components like new THM Fibula carbon rim brakes, SRAM Red eTap drivetrain (with Ceramic Speed rear derailleur pulley), DT Swiss’ new RC38T carbon Mon Chasseral tubular wheels plus Storck’s HFX Hysteresis Flex integrated carbon bar+stem. All that for just 14.999 euro! Comfy? We think not so much atop Storck’s MLP135 Monolink F3 D-shaped carbon seatpost and a full carbon Selle Italia saddle. Merida Reacto LTD: This special version of the Merida Reacto LTD was made to commemorate the 2017 World Road Cycling Championships in Bergen, Norway, with a paint scheme inspired by the Aurora Borealis. Castelli Speedsuit: The controversial Castelli Speedsuit from the Tour de France’s Stage One worn to the win by G Thomas included specially textured patterns on the shoulders and upper arms, which act as “vortex generators” and allegedly smooth the airflow around the body for more speed. Even if Article 1.3.033 of the UCI rules forbids the wearing of non-essential items, the UCI green lighted Sky’s speedy suits with predictable results: they WERE faster. Developed with researchers at the Norwegian University of Science and Technology this newest version of the Castelli Speedsuit. No word on if or when the new skin suit will be available, not to mention price. Castelli’s new Speedsuit features specially textured patterns on the shoulders and upper arms, which act as “vortex generators” and allegedly smooth the airflow around the body for more speed. Colnago C60 Mapei: A real standout in the Colnago stand this year at Eurobike was this C60 painted to match’s Colnago’s legendary C40 Maperi team bikes for the 1990’s. Colnago Concept: Ernesto Colnago may have been the first to innovate aero bikes in 1982 with his CX Oval design, and his latest incarnation of a slippery cycle is both speedy and beautiful. Colnago Concept was introduced early tis year and named after a bike Colnago introduced at the Fiera Milano cycle show in 1986, one of the first carbon fibre road bikes that was a collaboration with Ferrari. 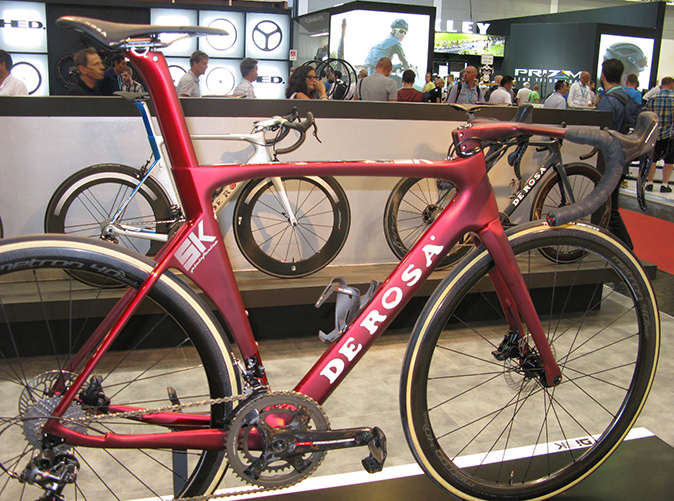 This aero Concept is made in Taiwan at Giant and the construction is pristine and has been been extensively tested in the wind tunnel to be faster than Colnago’s V1-r aero ride, where at 50kph, Concept saves 4 watts over the V1-r. Equipped here with Campagnolo Super Record mechanical and Bora 50 wheels, the Colnago Concept was a real traffic stopper at the Eurobike shows.